It isn’t that I haven’t been writing, it is that I’ve been either writing notes in my literature log or working on the backlog of Ghana posts for http://goingeast.ca. My original plan had me returning to Ottawa today, but when I found out the tall ships festival started tomorrow, I mentioned it to my husband, who supportively suggested that I extend my trip. I had thought to extend by a day or two, but the soonest availability return flight was Tuesday. So, my trip is now one day short of two weeks. It has been a week, and I’ve camped each night, even when the weather wasn’t the greatest. I’ve discovered that I really do like camping on my own. Even though I can’t share the load of camp chores, I find that I’m enjoying the opporunity to only take care of myself. That being said, by Tuesday, I’m sure I’ll be happy to be home and ready to return to normal life. The weather was hot and sunny on the weekend. 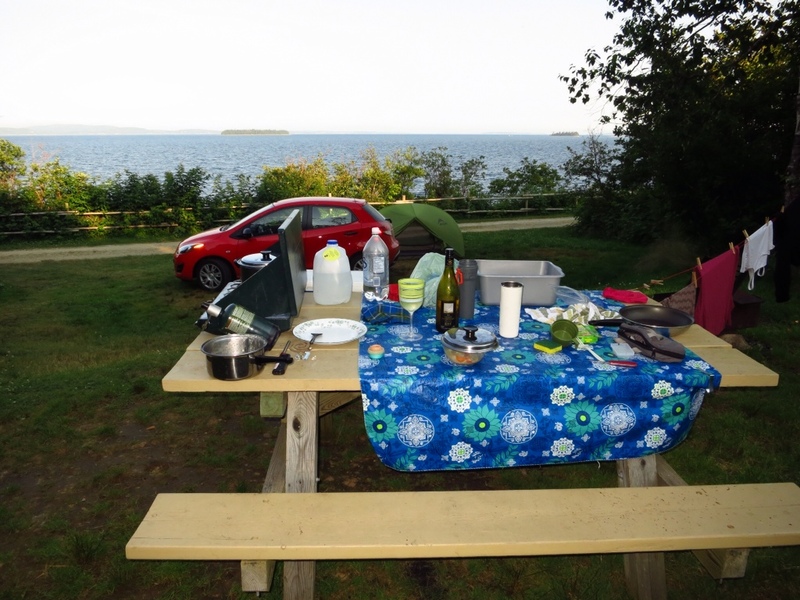 I was forced away from the coast due to a lack of decent campsites. I learned my lesson, and reserved sites for this coming weekend. On this trip I will have stayed at Murphy’s Camping (first night, and last two camping nights), Graves Island Provincial Park (one night before the weekend, then three nights), Kejimkujik National Park (two nights), and King Neptune Caming near Peggy’s Cove (three nights). Nominally, all places had Internet, although Keji’s Internet was spotty at best – it worked on Friday when I was the only one trying to use it, but otherwise, I couldn’t even get my email to fully sync. I find the different feelings of the campsites interesting. Murphy’s had a community campfire at night, which made people more friendly during the day, and the entire campground less smokey, as people would forgo their individual fires and join the community one. 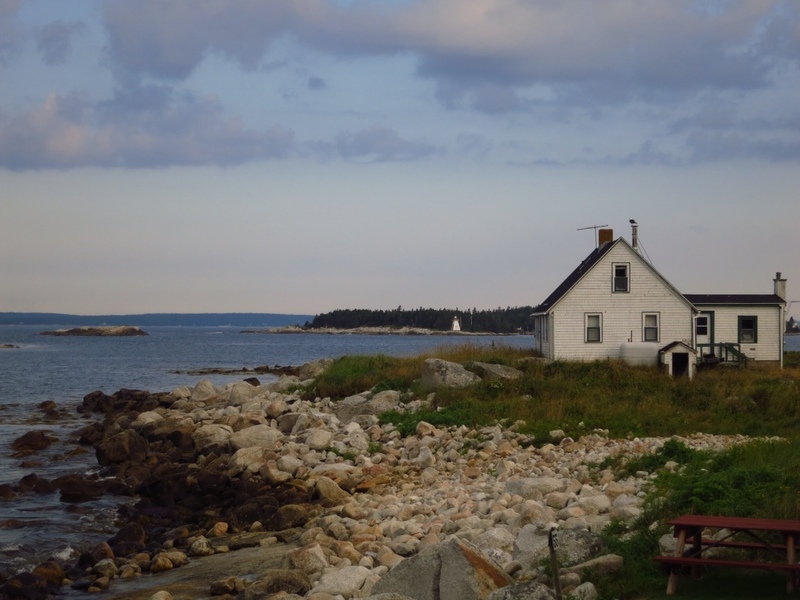 At Graves Island people were more standoffish, the sites were more private, leading to a more private camping experience, Keji was full of young families with children and dogs running about, and King Neptune has an interesting mix of friendly people and positive energy. The tone at King Neptune is set by the owners adult daughter Elva, who makes you feel welcome the moment your arrive. My favourite time camping is first thing in the morning. I enjoy sipping coffee and reading or writing preferably before everyone else gets up and feels the need to come over and say hi. Travelling alone, my mornings are pure bliss. It is extra peaceful when I can sip my coffee while watch the ocean waves slash onto shore. A part of me wishes every morning could be started this way, but then, I don’t think I would appreciate it nearly as much if it was everyday. 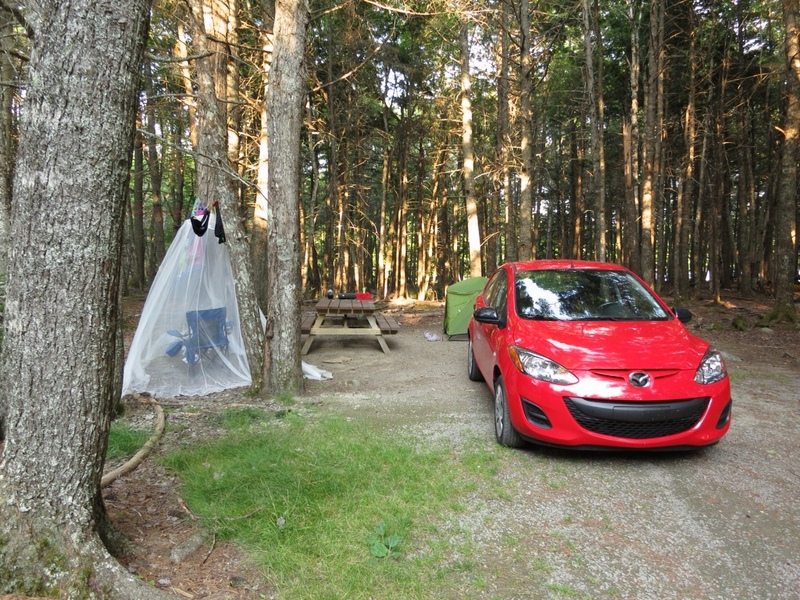 Campsite at Keji. This was taken in the middle of the afternoon. The shade was really nice, and I was close enough to the lake that when there was a breeze it was nice and refreshing. Graves Island Provincial Park. This is the same campsite that my husband and I stayed at about 10 years ago, on our first failed attempt at cycle touring (I blew out my knee the first weekend in tha 3.5 week trip – oops). View from my campsite at King Neptune camping near Peggy’s Cove.